At 15 minutes before the race started, there were no queues at the loo’s. Bonus! Even if I thought we were standing close to the front of the start pack, when the race started, it looked like a kilometer of runners stretched out in front of us. I have started to recognise the same faces from previous races and it’s great to say hello as we head on out. You get water points and you get water points. But two water points on this race rocked! Having KK meet me at the 19km mark to run me to the finish line – Wonderful! I was filled with emotion. A girl who had run slightly ahead of me the entire way slowed down in the last kilometer. I pushed her in front of me when we got to the field. It’s only right that she deserved to finish the race ahead of me. Don’t under-estimate the awesomeness of a hotdog after running 21.1km! If you ran and would like to add to my list, feel free to do so. See you next year Pick ‘n Pay! 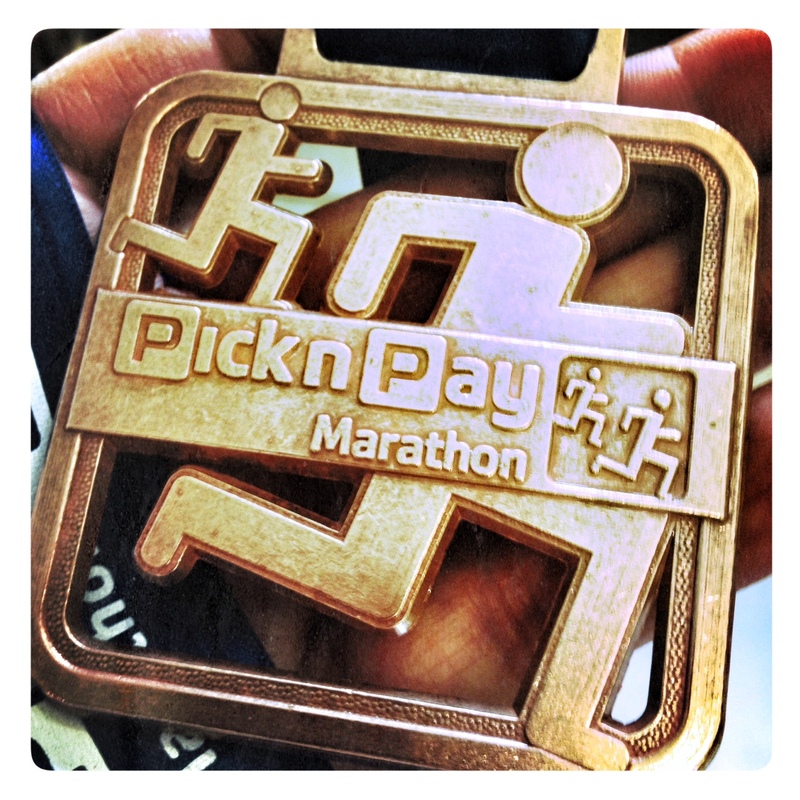 This entry was posted in My Races, My Running and tagged 21.1km, Pick 'n Pay half marathon, road race by Bo. Bookmark the permalink. Oops meant to say second last entry. I think you’re fabulous, especially reading your send last entry. What a nice thing to do! How was the route and scenery? A few people from work did it too, am sorry I missed out. I just felt that I wasn’t quite ready to take on another half marathon just yet, am concentrating on my training for the Two Oceans half right now. It’s a great route but then again, I grew up in Bedfordview. See you next year for sure!